I wanted to chat and get/give some advice about panel layouts. It's a hurdle that all comic creators have to jump over. I know my biggest issue was trying to make sure the panels flowed the correct way (up down, left right) and weren't confusing at any point. So consider this a general panel layout advice thread! Post any tutorials, or your own advice that you think will help a ton for improving on panel layouts! Re: Let's Talk Panel Layouts! I am certainly no expert in this arena. I've always just gone with what felt right for the piece of the story I was trying to tell. Here and there I'll experiment, and sometimes it's successful... other times I have confused my readers (and sometimes myself). I've gotten better about it, but certainly could use some fine tuning. I've found that less is often more and reduces possible confusion. So my pages will often be between 3 and 6 frames, and very rarely more than that. Mostly I use the rectangular paneling, and now and again do free form, rounded or jagged frames should there be a certain flow of information or say action. That it can either be read either way, or that the flow of information is obvious. I agree, less can be more! The example panel layout you showed is a simple symmetrical layout, which can be potentially confusing, but the way you handled the effects and balloons helps guide the eye in the right direction! With Falconhurst, I've had issues with symmetrical panels. Have you experimented on varying the width between panels (closer width for left-to-right and larger widths between up-and-down)? 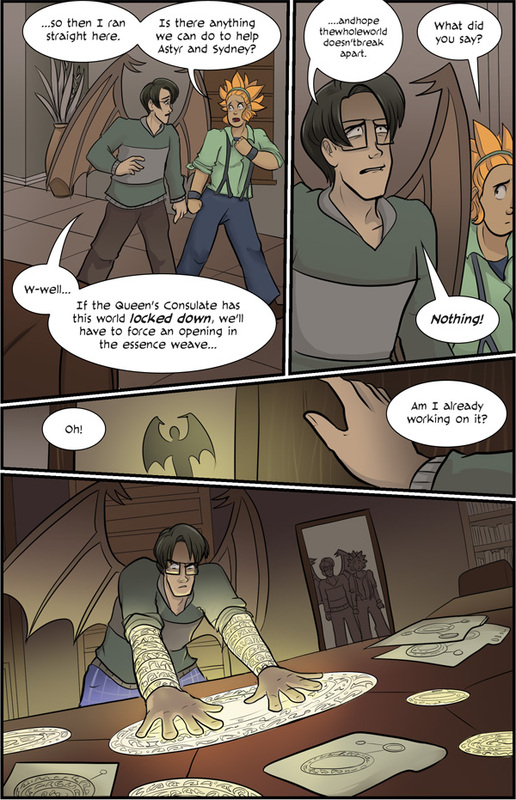 I've found that webcomics can be read differently from printed comics (in terms of composition) because the entire page cannot fit entirely on the screen. Instead, you have to scroll down to see more of the page. That's why I think a lot of webcomics focus on "horizontal" spaces. But when you look at those pages objectively, it can be confusing as to whether the eye is supposed to go to the right or down. But as your example showed, using effects and balloons can also help guide those eyes! I guess what I could do in the future is try to incorporate more overlapping effects, as well as experimenting with gutter widths! 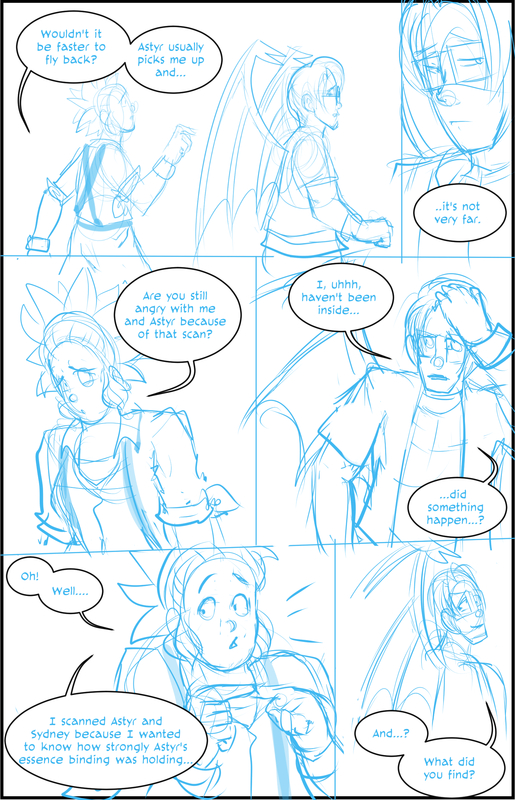 I like to do about 6-8 panels per page, and frequently one of them will be broken out behind the others. I like this because I tend to get bored with sequences of rectangular frames. Sometimes I'll change the shapes of my frames when a character feels off-kilter, and if I do a mix of horizontal and vertical I try to lay it out so it's still intuitive what the sequence should be. 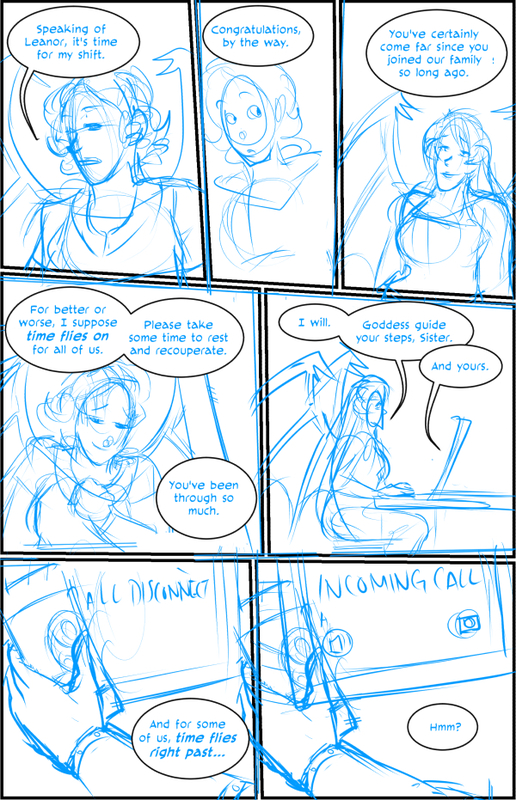 I might even do a tall panel that takes up one whole side of a page, with everything on the other side concurrent with it. Or, you know, just do a big ol' drama shot. Here's my thing. I really like variance. The earliest comic books that I really like were manga (#myanimeisinthetrash), and I took a lot of influence from the types of paneling that my favorite artists used. But I also read over my pages as I draft them and make sure that the variations aren't coming out too confusing. If I find myself constantly reading a bit of dialogue out of order or looking at the wrong thing first, I know it's time to rearrange some elements so that it stops happening. I dunno if this is helpful at all, but I hope so! Don't worry, it was totally helpful! In fact, I could probably take some notes from you about irregular panels! I rarely ever use them, but I usually like to save them for dramatic moments (of which there are very few). But some of the examples you showed me got me thinking, such as this one! I really like how you break up panel 3 for an emotional effect! And getting rid of a border in a scene really helps with expanding the scene and making it seem more open! Oooh, great topic! I love paneling! 1. Make one big full-page panel in Manga Studio/Clip Studio and sketch your key shots. Either keep your sketches on different layers or use the lasso selection tool to move them around, but keep them loose. 2. Start thinking about the text on the page and make some text bubbles with your script. In general, I try to keep one sentence per bubble and keep the words in each as diamond-shaped as possible. 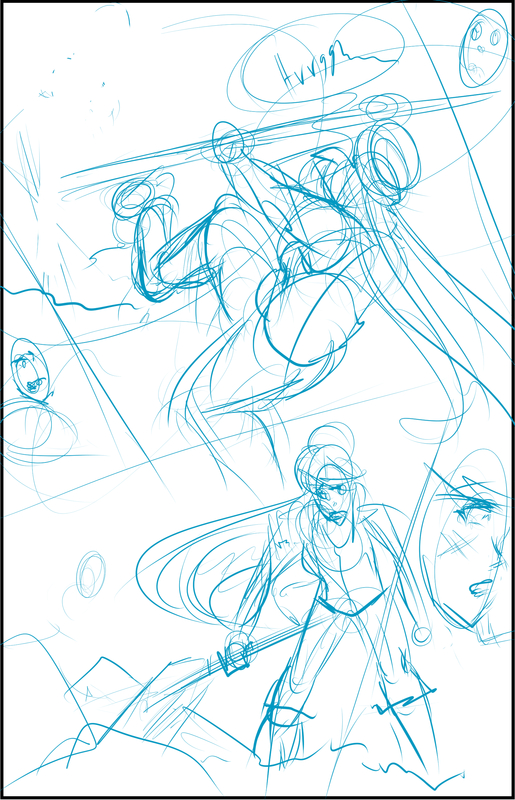 This helps me determine where I want to split up my panels, which I do as a sketch in a new layer. 3. Once I'm generally happy, I use the layer slicing tool in Manga Studio to cut up my large panel along the guidelines I made. Manga Studio gives you a folder for each panel, so then you copy/paste and transform your sketches inside the panel and resize them until your imagery has a nice balance and there's not too much dead space. You can also move the panel borders after you slice them, so if anything's too tight, you can scoot them up or down to take space from panels where you have too much (and vice versa). 4. When you want something to have more impact, be creative with your panel shapes! I'm a big fan of diagonal and breakout panels when you have a lot of action going on. 5. 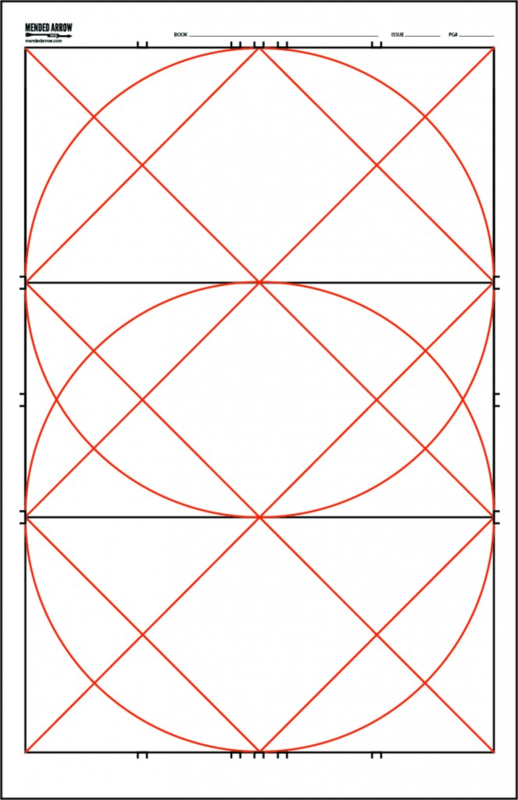 Figure out what your big important panels are and vary your shots and panel sizes accordingly. Don't be afraid to crop into faces or shift things around to get the focus you want! When you have two people talking, you don't have to give them equal staging if one's the focus - shift one to the background. One trick I use is if I have a shot I want to be more impactful or important, I'll try to make the panels leading up to it smaller so there's a big contrast. I'm sure there's more, but that's what I got so far! Oh believe me, that's why I made the joke. OMG I'm honored for the reference! Have you experimented on varying the width between panels (closer width for left-to-right and larger widths between up-and-down)? FAIR WARNING: NSFW content below! 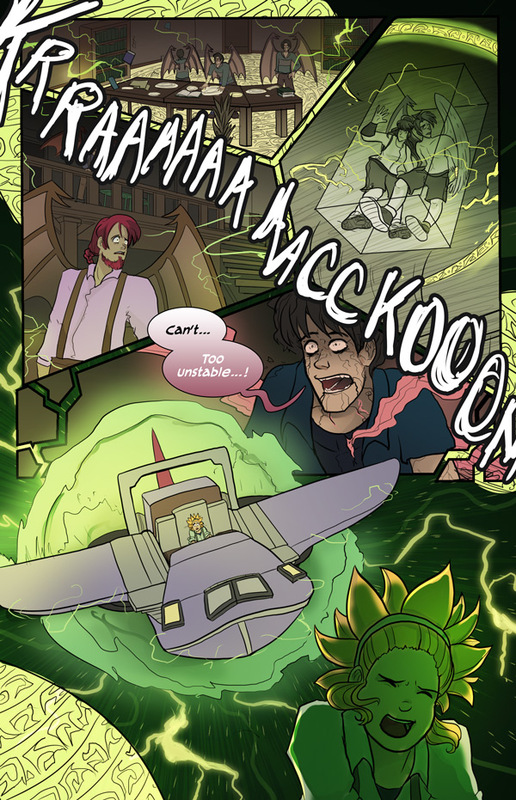 Here's a recent page where I did the vertical storytelling with varying heights of cells. While it still can be read either hz or vt it does suggest a way to read it. This is one of those experiments I wasn't exactly the happiest with, (I've done other, better ones.) though it does do sorta what I want which was flowing one panel into the next. I rather like how this one implies the protagonist is losing his battle with consciousness. The center of this page does well to imply continued action. So I am pretty happy with it. Here's a pinterest collection I ran across full of inspiring panel ideas and tips. And a goofy chapter on panels from an old book on cartooning. (large PDF) The rest of the chapters are here. Dated, but mostly timeless. 2. Don't cover your art. One big no-no I learned early on was to compose with your art in mind. Don't put word bubbles in front of characters if you can help it. I do less of it now so ignore my bad habits in the next things I share, lol. 3. Examine your composition with flow lines if something feels off to you. You want to build a Z or some sort of S curve for most of your work. Use panels and word bubbles with your art in a way to guide your reader's eyes. I posted a few examples of the things I had during a critique once and adjusted a tad with some lines showing you how the eye goes when reading some panels, etc. 4. Don't ever forget the 180 degree rule. In movies, they try to stay on one side of their actors when they capture the story. This helps the reader's brain with the spacial relationship of your characters. The previous things I mentioned like the big story board method and drawing flow lines will help you adhere to this and make your eye flow well. There are a lot of other technical things too like panel lengths and widths that communicate to your reader's brain to perceive time, camera angles, various types of layouts like establishment/splash pages, etc etc. but I've done well just to adhere to the top four! I thumbnail/layout my pages in batches of 2 inch by 3 inch panels and then after I'm satisfied with the composition/eye direction/and placement of dialog balloons, I print out each panel to original art size. I draw with pencil on 12 field animation paper (10.5 x 12 inches), and scan the cleaned up pencil drawings into jpegs. I effin' love panel layouts! 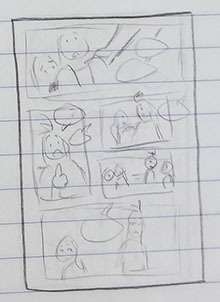 I do small scribbly pencil thumbnails of each comic first to make sure word bubbles will fit without getting too wordy and be read in the correct order. Note the placement of the word bubbles and where they lead. Word bubble placement is crucial and should be planned before any drawing is done. And like ArtistSage mentioned, try not to cover your art or characters. 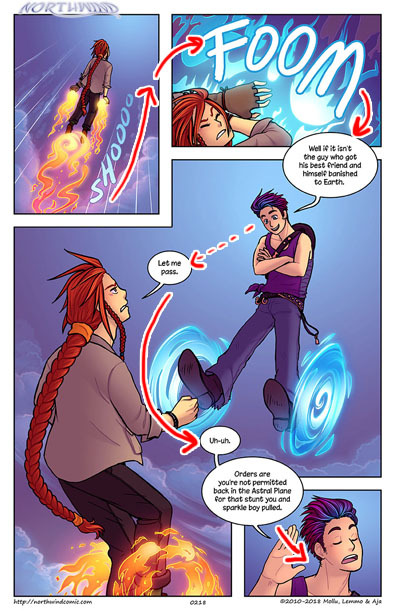 There are tons of ways to lead the reader's eye, including sfx, word bubbles and their tails, characters' line of sight, and the actual characters' bodies or other objects in the scene. Orange fire guy and his shoooo sfx point towards the FOOM in the next panel, which arcs down to point at blue fire guy's word bubble. Then what is blue fire guy looking at? Orange fire guy's word bubble. Then we travel down orange fire guy's body that curves to the last word bubble and the final panel.